I confess: We are a family that loves stupid jokes. We probably know just about every chicken joke out there. Dinner conversations are speckled with jokes about trumpet players versus French horn players, both of which my two daughters play. My son’s quest is to stump the family with his own made-up jokes about what the mayonnaise might have said to the refrigerator. So, we thought it was funny when we saw the above quote in an online picture. Then I laughed when I received an email about chicken salad. Just as there are numerous chicken jokes around, there is a bounty of chicken salad recipes. Curried chicken salad, buffalo chicken salad, waldorf chicken salad, tarragon chicken salad. You name it, the variety exists. 1. The chicken: Chicken salad needs chicken – obviously. But what part of the chicken used can vary. Traditional chicken salad will use chicken breasts, usually poached so they’ll still be juicy and tender, and cut up into squares. Other varieties will use the dark chicken meat. Still more simply tell you to pick apart a whole cooked chicken for a mixture of dark and light chicken meat. It’s really up to you and your tastes and health needs. Chicken breasts will yield a chicken salad with slightly less fat than a mixed or dark meat chicken salad. Chicken breasts can be drier, though, and require more dressing. I usually only make chicken salad with leftover chicken so my chicken salad will vary with whatever we had for dinner – whether it was chicken breasts or a whole roasted chicken. 2. 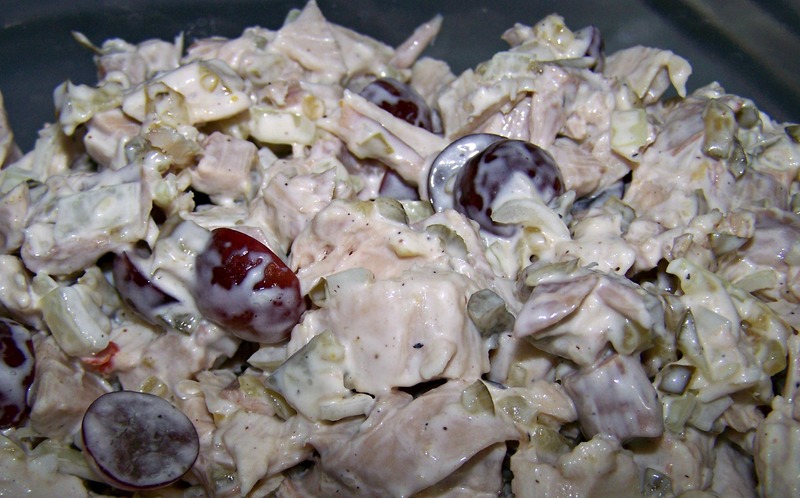 The dressing: Traditional chicken salad uses mayonnaise. Some use a vinaigrette. Others use yogurt. A few simply tell you to use a dressing such as Ranch. Again, it’s what you like and need. If you are allergic to eggs, you’re not going to want to use an egg-based mayonnaise. Fortunately, there are plenty of tofu-varieties around if you do prefer a mayonnaise-type texture and flavor. If you are looking to eat healthier, yogurt makes a good dressing. If you like your chicken salad light, a vinaigrette is the best way to go. 3. The additions: What should go in a chicken salad depends on you. Some folks are traditionalists and only ever add celery and onions to their chicken salads. Others like more vegetables and add things like grated carrots and zucchini. I like to add fruit like red grapes or chopped apples to mine. 4. The seasoning: A basic chicken salad just adds salt and pepper. Nowadays, though, we’re into jazzing up our chicken salads. Herbs such as tarragon and rosemary and thyme are good flavors for chicken salad. For people looking for something a little different, adding curry powder to the dressing is a nice change. If you like a little tang, lemon juice and ground mustard work well. 5. The Tips: If you’re starting with a freshly made chicken or chicken breasts, let the chicken cool before adding your dressing. If you have the time, refrigerate your chicken salad for the flavors to meld. 1. Mix the chicken with the grapes and carrots. 2. Mix the yogurt with the mayonnaise, thyme, oregano, and black pepper. 3. Mix the chicken with the yogurt dressing.